I’m recalling the first Sunday in Advent 1979, when I was blessed to be part of a choir that was performing in the National Cathedral up on Mount Saint Alban’s. 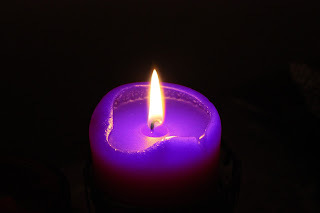 It was a memorable Sunday on many levels that included hearing a homily whose takeaway was “Advent begins in the dark”, a catchphrase that has stuck in my head for nearly 35 years. The Homilist employed an apt visual reference pointing to the wreath that would glow ever brighter before the season’s conclusion. I believe though that the weight of this statement extends far beyond the lumens provided by the five candles and the setting of that first Advent bears witness to this fact. Advent began in a period of Sociopolitical Darkness. For more than half a millennia, Abraham’s children had been an oppressed and occupied people. Her golden age and the splendor of Solomon’s temple were little more than stories told by grandfather’s to their grandchildren. Worse still, they were now into the second generation of being under the iron boot of the Roman Empire. Against this backdrop and in an act of subversion against the kingdom of darkness, the Angel Gabriel stepped into the realm of time and the Holy Spirit hovered over a comely virgin of the House of David. Advent began in a period of relative Spiritual Darkness. Four hundred years had passed since a Prophetic voice was heard in Judah. Those who were waiting for the Consolation of Israel knew the teaching of faithful Rabbis and the endless circle of sacrifice but never knew the sound of one speaking under the unction of the Almighty in prophetic counsel. The dark silence would be shattered as the angel pronounced fulfillment of multiple prophecies concerning the coming Messiah. But consider too how Christ’s Advent into our own lives also began in the dark. We all at one time, walked in spiritual darkness. Each of us, as Saint Paul wrote to the Ephesians, were living far away from God and living to serve ourselves and our own desires; our past, present and future held only the dark and starless night. Yet when the Holy Spirit moved upon us to convict us of our transgressions and convince us of our need for a Savior, both life and light was brought to us in the new birth. Those who know the Christ of Advent can take comfort in the fact that the child born in Bethlehem is the very redeemer who will again return to make all things new. No matter how dark it may seem, His glorious light will burst forth at the Father’s appointed hour. This Advent which began in the dark will culminate in glorious light.